He pointed out that it can be particularly beneficial for the do-it-yourself market. “All lumber is not the same, even though it may be graded the same. The grade is based on a range of values and characteristics,” Mr Seale said. “Perhaps a consumer has a pack of lumber which meets the specification for No. 2 grade, but they need a couple of pieces for a header, something that might span the opening for a window or door. Frederico Franca, the app’s co-developer and an assistant research professor in sustainable bioproducts, first envisioned the app when he discovered that the equipment designed to test lumber costs around US$84,000. His love of physics, along with the desire to create something less expensive, fuelled his idea for a smartphone app that would render lumber values through the use of sound and vibration. “This app can help further evaluate lumber within established grades, potentially optimizing the longevity and cost efficiency of wood structures by selecting stiffer pieces for situations that demand higher performance,” Mr Franca said. The app is available for download in the Apple Store. Visit https://itunes.apple.com/us/app/smart-thumber/id1436858557? 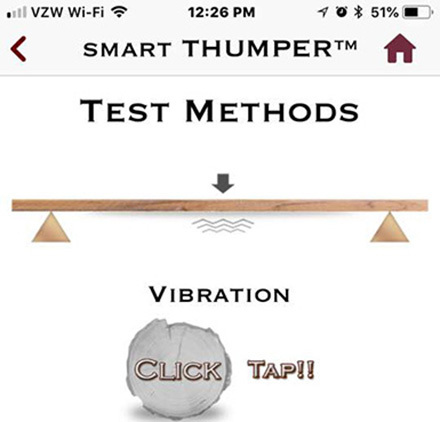 mt=8 (https://itunes.apple.com/us/app/smartthumber/ id1436858557?mt=8).